Aluminum alloy construction makes it a lightweight, oxidation resistant and shock resistant handlebar stem. 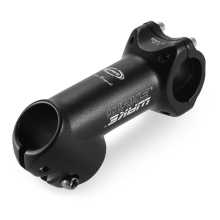 Front fork stem diameter 28.6mm. Center distance of the two holes is 90mm. +/- 45 degree for easy installation and adjust the height of the handlebar. Used mainly for mountain bike and road bike.